The three-leafed shamrock, that is depicted on this Irish Christmas ornament, was used by St. Patrick to explain the Holy Trinity when he expanded Christianity in Ireland during the 5th century A.D. This Irish Christmas ornament features a colorful art decoupage design that is enhanced with shamrocks that are decorated with Celtic knot-work. The 3" diameter bauble has a repeated design and it is ready to hang on your tree with the included Irish themed ribbon. The shamrock Christmas ornament is attractively gift boxes with a brief history of the iconic Irish symbol. 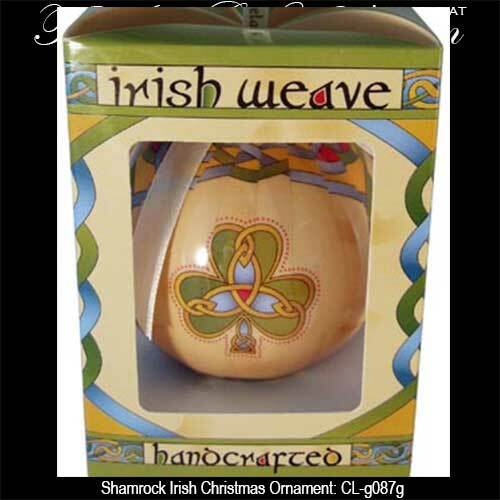 The Irish Christmas bauble is made in Ireland by Clara and it is received with shamrock and Celtic knot history cards, complements of The Irish Gift House.